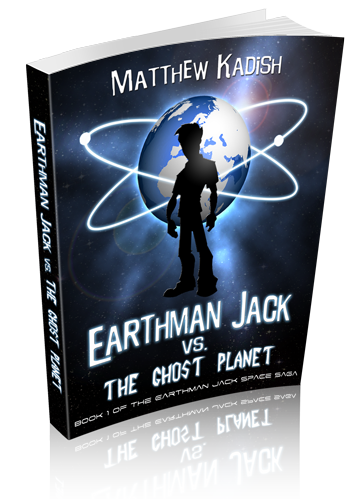 Sign up for my email newsletter to download a free version of the Special Edition of Earthman Jack vs. The Ghost Planet! 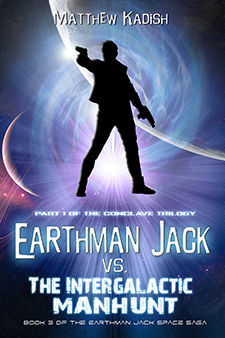 The Earthman Jack Space Saga is a series of nine planned novels following the adventures of Jack Finnegan, and his journey from an unknown teenage slacker to one of the greatest heroes the universe has ever seen. Jack’s saga spans many years, multiple planets, a couple of dimensions, and more cheesy one-liners than you can count. 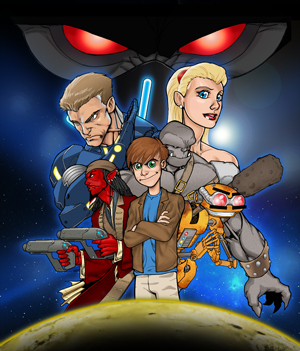 As the story progresses, you’ll see Jack’s journey from the small-town underachiever he started out as on Earth, to a courageous hero who saves the galaxy from utter annihilation. Along the way, Jack is helped out by an assortment of odd-ball allies, and meets some truly frightening and formidable villains as well. There will be lots of autonomous robots, ruthless cyborg bounty hunters, magical superheroes, devious politicians, and interesting aliens that cross Jack’s path. There will also be epic battles (both in space and on the ground), universe-shattering events, personal tragedies and triumphs, strange science, and fascinating mysteries that will unfold, all with Jack at their center. 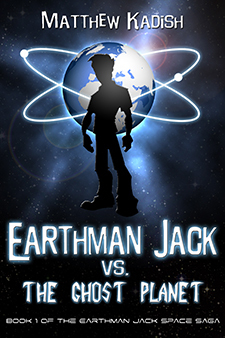 If you’re a fan of adventure, science fiction, fantasy, superheroes, true love, magic, and awesomeness, then you’ll definitely want to experienceThe Earthman Jack Space Saga for yourself! 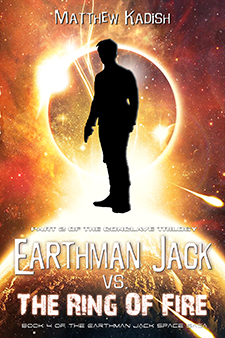 In two words… Earthman Jack is EPICALLY BRILLIANT! I actually experienced an emotional high when I was done reading this book. From the first page I was totally sucked in. I’m in my thirties and though this book is in the young adult genre, anyone of any age can find enjoyment while reading it. I. Loved. This. Book. I loved this book like I love chocolate. The more time that passes from the last page flipped, the more my love for it grows. There are Five Star-reviewed books that certainly deserve their five stars and then there are Five Star-reviewed books that should have an addendum that warns you of the sadness that will be felt when the book ends and your friends get stuck in the pages, their adventures (with you the reader) temporarily on hold until the next book. 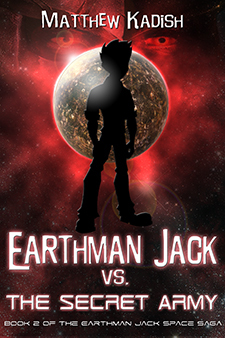 Awesome space adventure with zombies, evil aliens, & a killer tornado… Earthman Jack vs. The Ghost Planet by Matthew Kadish has it all! With its mixture of sci-fi action and coming-of-age themes, Kadish’s novel is an intriguing candidate to fill the void that was created when J.K. Rowling penned the final novel in her popular Harry Potter series. I couldn’t help imagining this book as a fantastic graphic novel or 3-D film. Co-directed by J.J. Abrams, Michael Bay, and Peter Jackson… (heck), I’d see it. The main characters are deep and original. The plot is unpredictable, and the twists will have you rebooting your brain before you can keep reading. The story is lovable and somehow believable. 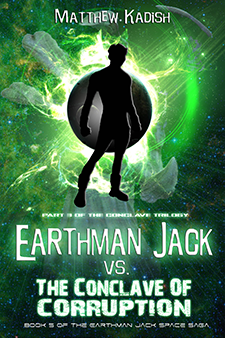 Earthman Jack vs. The Ghost Planet is written for the teen and young adult as a sci fi fantasy. I loved it. The language suits all ages. THe plot develops well and is complex but not difficult to follow. The characters are believable. I was sad to see some go. To say Earthman Jack vs. The Ghost Planet is AWESOME would be the understatement of the year. I loved every page. In fact, I’m tempted to say this may be the most fun I’ve EVER had reading – and I’ve read a lot of books. A cavalcade of geeky sci-fi delights! I was born a poor black child in the Tsunami-ravaged area of post-Katrina New Orleans, where I lived in an inner-city trailer home that spontaneously combusted due to terrorist activity. I was left homeless and on the streets, where I was forced to use my wits to survive. I currently work five dead-end jobs, struggling to make ends meet, while juggling the challenges of being a single mother. I wrote 500 pages of my first novel on a napkin at a coffee shop in Edinburgh because my laptop would keep distracting me with cute videos of kittens on YouTube whenever I attempted to use it. Writing is especially difficult because I suffer from a debilitating form of carpel tunnel syndrome and an incurable form of arthritis, which combine into a super handicap which requires me to use robotic arms for daily tasks. All the kids make fun of my robotic arms, and I don’t think I will ever recover from the emotional scars of always being picked last in gym class. And worst of all: I never learned to read! In my spare time, I enjoy watching late night movies on Cinemax, practicing the deadly art of ninjutsu, and letting go of balloons while walking along the beach so I can watch them magically fly away. 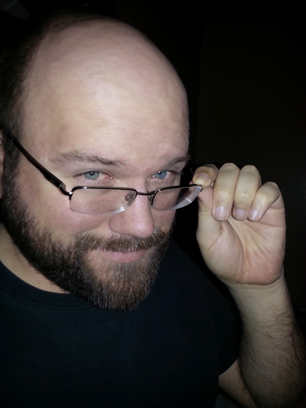 I’m also incredibly attractive and any woman would be lucky to have me. I know this because my mother tells me so all the time. I have a personal manservant/henchman named Bucky, whom I suspect might actually be a robot. He does my laundry and ensures my clothes always smell like mountain spring breeze. He’s pretty cool. My arch-enemy is the Leprechaun from the Lucky Charms box. He continues to taunt me while I patiently plot my revenge. I’ve recently formed an alliance with the Trix Rabbit and Count Chocula to bring him down for good, but please don’t tell him that, I want it to be a surprise. I currently live in Las Vegas with my dog Peekaboo, in a house which I suspect might have a gas leak, since I’m feeling extremely light headed as I’m writing this. I hope to write as many novels as I can before the machines become self-aware and take over the world. I’m currently on an adventure that involves uncovering an ancient secret and saving the President of the United States. I’ll let you know how it turns out. Until then, thanks for visiting my site. I hope you enjoy my writings and tell all your friends about how cool I am. P.S. I’m a terrible liar. This section of my website is devoted to the amazing fans who are supporting me and my efforts through Patreon. You special people get a shoutout in your own special section of my website! Click here to have your name included on the Wall of Awesome! The best the universe has to offer are listed here! Click Here to become a Paragon! The pinnacle of Awesomeness! These people stand out above all others as true heroes of The Jackverse! Click Here to become an Emperor!